Since joining Stewart-Haas Racing (SHR) in 2014, Kevin Harvick has established himself as the fastest, most dominant and consistent driver in the Monster Energy NASCAR Cup Series. A championship in 2014, a runner-up finish in the 2015 standings and a third-place effort in 2017, coupled with 14 wins, 15 poles and an astounding 6,665 laps led cement this assertion. In 2014, Harvick won five races, tying his season-best effort. He won a career-high eight poles – two more than in his 13 previous seasons combined. He led 2,137 laps, becoming only the third driver to lead more than 2,000 laps in a single season since 2000. The most laps Harvick led in a single NASCAR Cup Series season prior to 2014 was 895 laps in 2006. Of the 24 NASCAR Cup Series track qualifying records set in 2014, Harvick accounted for six of them. No other driver had more than four. Lastly, the title allowed Harvick to become only the third driver to earn both a NASCAR Cup Series championship and a NASCAR Xfinity Series championship, joining Bobby Labonte and Brad Keselowski. Harvick is a two-time Xfinity Series champion, having scored those titles in 2001 and 2006. Kyle Busch and Martin Truex Jr. have since joined the elite group. Harvick picked up in 2015 where he left off in 2014. He won three races, including back-to-back events at Las Vegas Motor Speedway and Phoenix Raceway in March, and established new single-season career bests with 23 top-five finishes, including 16 top-twos and 28 top-10s through the 36-race season. Harvick also led 2,294 laps to eclipse the 2,000 laps-led mark for a second consecutive season, becoming the first driver to lead more than 2,000 laps in back-to-back seasons since Jeff Gordon in 1995 and 1996. Harvick closed out the 2015 regular season with 978 points prior to the NASCAR Playoffs, which followed the 26th and final regular-season race at Richmond (Va.) Raceway. Harvick’s total through the first 26 races was the most under the current points system introduced in 2011, surpassing the 914 regular-season points scored by Greg Biffle in 2012 and Gordon in 2014. After finishing among the top-five in the NASCAR Cup Series championship standings six times prior to 2014 (his previous career-high points finish was third, which he accomplished in 2010, 2011 and 2013), Harvick is a NASCAR Cup Series champion who has compiled the two best seasons of his career (2014 and 2015) while at SHR. 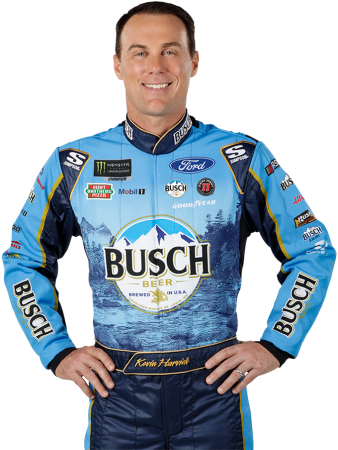 In addition to his impressive performance in the NASCAR Cup Series and his two Xfinity Series championships and 46 Xfinity Series wins, Harvick has 14 Truck Series victories. Harvick’s drive was set into motion at age 5 thanks to a go-kart he received from his parents for his kindergarten graduation. After gaining experience in his go-kart, Harvick began racing at local tracks at age 7. For 10 years he was a force on the karting circuit, earning seven national championships and two Grand National championships. Harvick’s hard-charging style and success behind the wheel caught the eye of NASCAR team owner Richard Childress, who selected Harvick to drive the team’s No. 2 entry in the Xfinity Series for the 2000 season. In his first full season with Richard Childress Racing, Harvick scored three wins and finished third in the championship while claiming Rookie of the Year honors. Along the way, he gained a reputation for being aggressive on the track but, off track, his affable attitude and ever-present smile earned him the nickname “Happy”. Harvick was set to compete full-time in the Xfinity Series in 2001 while making select NASCAR Cup Series starts for Childress’ No. 30 team. But his career path was forever altered on Feb. 18, 2001when Hall of Fame driver Dale Earnhardt lost his life in an accident on the final lap of the Daytona 500. Days following the tragedy, Childress appointed Harvick to drive in place of Earnhardt, renumbering the famous No. 3 machine to No. 29 in time for the second race of the season at North Carolina Speedway in Rockingham. This new role was in addition to Harvick’s duties in the Xfinity Series, where he was competing for the championship. Harvick proved he was up to the daunting task of following a legend when, in his third NASCAR Cup Series start, he scored his first win March 11 at Atlanta Motor Speedway. As the season continued, so did Harvick’s winning ways as he claimed the checkered flag in the inaugural race at Chicagoland Speedway in Joliet, Illinois. He earned Rookie of the Year honors en route to a ninth-place finish in the season-ending championship. Harvick’s strong performance during his rookie season in the NASCAR Cup Series earned him a spot competing against all-star drivers from a variety of racing disciplines in the 2002 International Race of Champions (IROC), and the young driver did not disappoint. He scored a victory at Auto Club Speedway in Fontana, California, and tallied four top-10 finishes, which led him to the championship in the prestigious four-race series. Harvick also racked up six Xfinity victories in 2007. But Harvick the owner enjoyed the most success in 2007 as KHI earned its first Camping World Truck Series championship with NASCAR Hall of Fame driver Ron Hornaday Jr. While Harvick didn’t reach victory lane in the NASCAR Cup Series in 2008, he produced strong enough performances to make the playoffs before finishing fourth in the season-ending standings. He also earned a Truck Series win at Phoenix. On Nov. 4, 2015, the foundation, in partnership with the Cal Ripken Sr. Foundation, hosted the grand opening of the new Ollie’s Bargain Outlet Field at Kevin Harvick Foundation Park at the Boys & Girls Club in Greensboro, North Carolina. The park is a 92,000-square-foot, synthetic-turf, multi-purpose athletic field designed to host youth baseball, girls softball, youth soccer and other outdoor recreational and educational activities for at-risk children at the Salvation Army Boys & Girls Clubs in Greensboro. The goal of the park is to provide at-risk children with access to a safe, clean, positive environment to participate in wholesome, out-of-school activities and mentoring programs while positively transforming not only their young lives, but the neighborhood in which they live. The park is complete with a scoreboard, dugouts, soccer goals, bleachers and fencing. A second project in conjunction with the Cal Ripken Sr. Foundation opened on March 16, 2016, when Harvick and Ripken Jr. cut the ribbon to unveil the Kevin Harvick Foundation Park at the Boys & Girls Club of Kern County in Bakersfield. Much like the park in Greensboro, the state-of-the-art facility in Bakersfield was designed for multisport use, featuring four outdoor fitness stations, a rubber track surface circling the field’s perimeter and a digital scoreboard. The park, a gift to The Salvation Army Boys & Girls Club of Kern County, is maintained by the organization. The Cal Ripken Sr. Foundation and Kevin Harvick Foundation continue to collaborate to create and implement character education programming and clinics for the children who utilize the facility. The Harvick’s welcomed their second child, Piper Grace Harvick, on Dec. 28, 2017. The family resides in Charlotte and enjoys golfing, outdoor activities and attending sporting events.